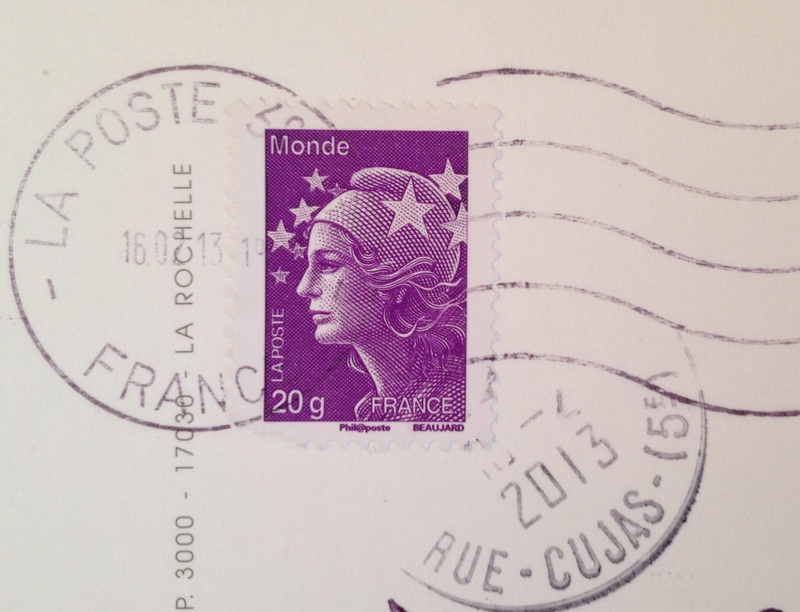 How did you fare on last week’s Postcard Monday? Did you figure out where the following landmark is found? Happy Monday! Here’s an Rorschach ink blot test and interesting rock formation all in one. Now to the tougher question: where in the world can we find this famous rock formation? Answer and postcard to be revealed next Monday! Happy Monday! Here’s another one to test your knowledge of famous landmarks. Where do you think this postcard was sent from? Answer and postcard to be revealed next Monday! Happy Monday! Thought we could play a game for Postcard Monday. 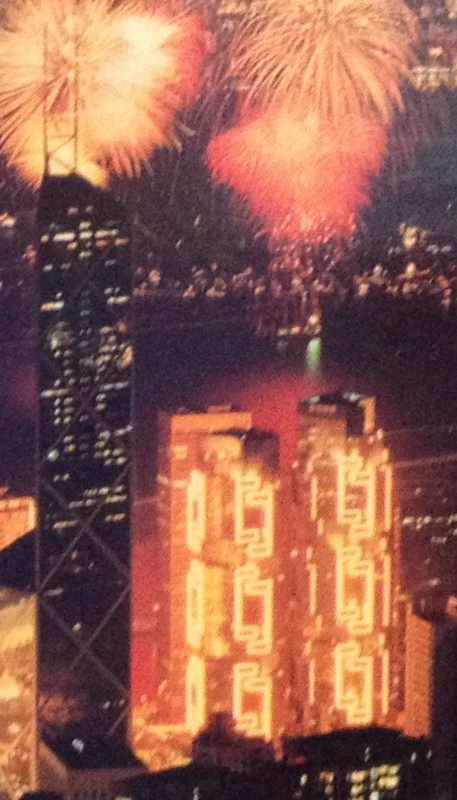 We’re going to start with an easier one: Where do you think this postcard was sent from? Happy Monday again! I did a quick count over the weekend and this is the 25th postcard Monday on TheTravelingUrbanite, thanks for following along! I’m sure not an insignificant number of people spent yesterday watching the super bowl (or at least eating snacks and watching super bowl commercials?). So who took the big game? The New England Patriots or the Seattle Seahawks? Came across this gem while going through my postcards and couldn’t resist sharing it – it doesn’t help that I love puns. It was sent to me from a friend visiting P.E.I., one of the most beautiful places in Canada (let’s be honest, it’s not hard to find beautiful places in Canada). To learn more about the inspiration for this play on words, check out Bite Size Canada’s post (it’s a great blog for a regular dose of Canadian history)! Last week Tommy Caldwell and Kevin Jorgeson became the first climbers to free climb the Dawn Wall of El Capitan in Yosemite National Park. I’m relatively new to climbing and am still a ways away from moving outdoors; but I have learnt enough to know that these men have accomplished an amazing feat. What is free climbing? It is when climbers only use climbing equipment to prevent falls. Often, in challenging climbs, climbers will use equipment to actively aid their ascent. This daring duo, however, scaled 3000 feet using only their hands and feet over a 19 day journey. Now that’s a real adventure! Check out the New York Times coverage of their ascent; it also has great information for those new to climbing and some amazing photographs. 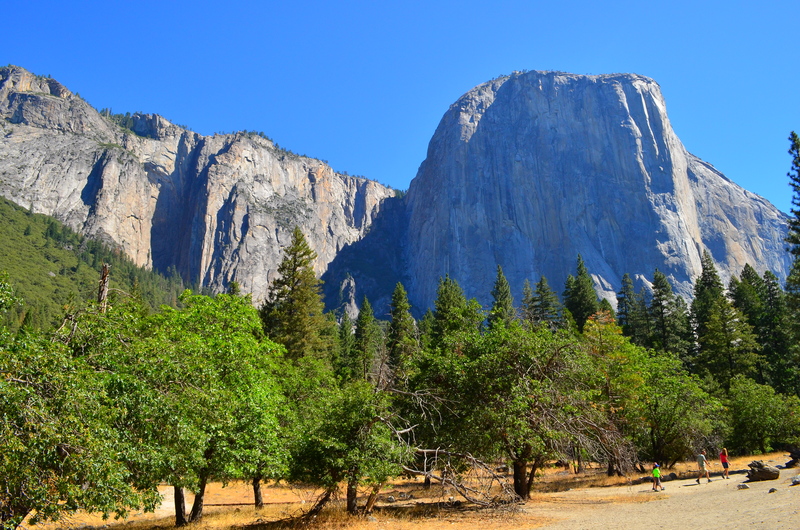 Below is my own photograph of El Capitan taken last summer during my visit to Yosemite; having stood at the base of El Capitan makes Caldwell and Jorgeson’s climb all the more impressive. Responsible traveling has long been a contentious issue and center of heated debates. With travel becoming increasingly accessible, it’s not surprising for us to wonder about how our travels abroad affect the people whose home we are visiting. I think I realized long ago the power of travel in broadening our perspectives; traveling helped me learn at a young age that there are many ways to be right – it just depends on how you look at it. As an adult, where some of my trips involved volunteer work abroad, I wrestled with a sense of unease when I travel. Even when I can see the immediate good work we were doing, in the back of my mind, it always felt traveling benefited me the most – my own personal growth – and that imbalance can be uncomfortable. Do you think travel can lead to meaningful change on how we view the world? 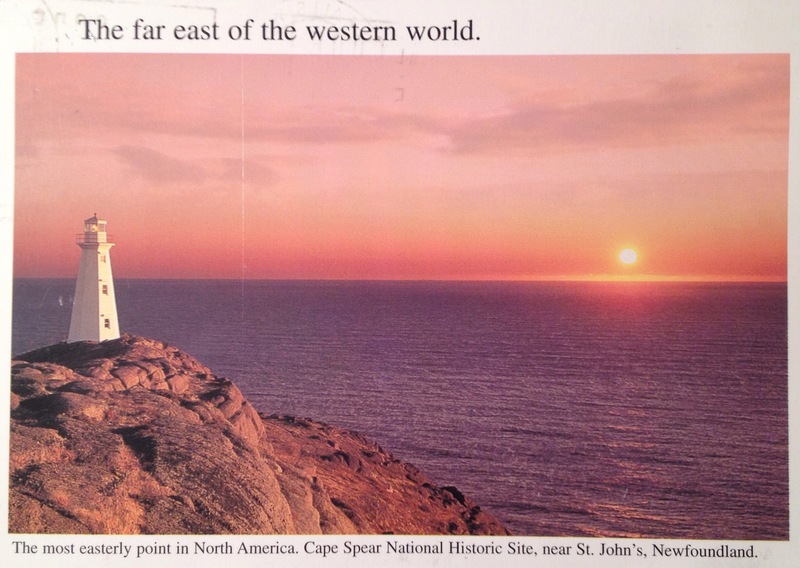 Not quite at the international date line, Cape Spear is the most easterly point in Canada and will therefore be first in Canada to greet the new year. It is also at Cape Spear in St-John’s that you will find the oldest surviving light house in Newfoundland and Labrador built in 1839. I’ve been to St-John’s very briefly and found it beautiful. It was during a snow storm and the kind gentleman who had waited past closing time for me at the car rental because my flight was delayed gave me some helpful advice: avoid the highway late at night to avoid any unplanned encounters with moose on the road – it felt very Canadian. So here’s wishing you a very Happy New Year from eastern Canada! May 2015 be filled with more travel adventures! Happy travels! I love that we still have snail mail because I get to receive cute postcards like this one. Whatever you may be celebrating this time of year or just enjoying life, a very happy Monday to you, and if it’s a special season for you, happy holidays! Whatever you may be celebrating, these cute kids will surely put a smile on your face. They did on mine! As another year comes to an end and a new year approaches, many people are thinking about how they can give back and do good. At this time of year, songs of peace and love permeate the media but peace often feels like an unattainable goal. Yet, every week, I am impressed but acts of kindness, both small and large. My work involves working with children of all different abilities and I am always amazed by each person’s innate resilience; in these children and their families, I see that we are always striving to find peace and doing so, we make the world around us just a little better. So from now on, instead of wishing or hoping for peace, I will strive for peace. Striving for peace likely looks different for everyone: it could be through small every day acts of kindness, supporting peace making and peace keeping activities, or learning to and helping others see the world from a different perspective. As a new year approaches, let us strive for peace. I was looking through my old postcards and found this San Francisco postcard that I mailed myself in 2001. We really did a whirlwind tour of San Francisco back then – we hit all the sites! I feel really lucky that I’ve been able to travel lots and I think as a result of visiting many places, I’ve learnt to slow down and focus on the here and now, to get a feel for the local pulse. I no longer need to see all the highlights to feel satisfied. There isn’t a right or wrong way to travel (as long as you’re respectful) but for now, taking it more slowly and soaking up the local flavours and culture is the way for me. Happy Monday! You can check out my trip to San Francisco from this past summer, 13 years after I first visited San Francisco here. While we’re on the topic of California, I also went to San Diego and Palm Springs this summer. I had the chance to attend a few weddings this year and feel really lucky to be invited and be part of an often intimate and important day in a couple’s life. We’ve already celebrated Thanksgiving in Canada but with American Thanksgiving coming up, I’m thankful for friends. I’m grateful that I am surrounded by so many talented and kind people. Today’s postcard is a wedding thank you card that the groom drew himself. Both bride and groom are exceptionally talented and artistic people and I thought this card was such a lovely way to thank their guests and share a little more of what makes them who they are. Thanks for the postcard and for letting me share it with others! Happy Thanksgiving! This year marks the 70th anniversary of D-Day and the Battle of Normandy. On June 6th, 1944 – 70 years ago – allied troupes landed on the shores of Normandy, marking the beginning of a decisive period that has shaped modern history. As we remembered, thanked, and celebrated those who have fought for their country in a number of Remembrance Day events this past week, it seemed appropriate to share this postcard sent to me from Normandy. Lest we forget. I was away for a month and came home to the most wonderful mail. While traveling in Iceland, a friend mailed me an airsickness bag – or more commonly known as a barf or vomit bag. I’ll go with ”emesis containment pouch.” In lieu of a postcard, I received a lovely message written on one of Icelandair’s cute little vomit bags. Iceland has been working hard at promoting its tourism industry and these little bags certainly weren’t overlooked! Good work Icelandair. See for yourself! This week I’m sharing a postcard that was sent to me from the town of Positano on the Amalfi Coast in Italy. I’m always looking forward to my next travels and when I receive a postcard from somewhere I have yet to visit, it makes me so glad that there are still so many beautiful places to see.